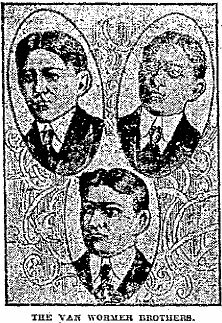 Willis, Frederick, and Burton van Wormer — stock, as their name suggests, of vintage Dutch family whose more reputable products ca be found on various Empire State placenames — were doomed for the Christmas Eve, 1901 murder of their uncle. The family tree’s branching over generations had put family enmities between relatives; in this case, working stiff John van Wormer’s home in Columbia County, N.Y. was mortgaged to his brother-in-law (and the eventual murder victim), richie-rich Peter Hallenbeck. After John passed away, Peter lowered the boom and foreclosed on the widow, booting John’s sons out of the house. The boys got even with an unsubtle gangland masked home raid, riddling their Uncle Scrooge with bullets. Though these three attracted national public sympathy — someone even telegrammed a bogus reprieve signed, “The President of the United States” in a vain stab at delay — their case was pretty open-and-shut. Since they were doing death as a brother act, it was only fair that they sort out precedence within the family: the condemned themselves decided the order of their execution, with Willis first, Frederick second, and Burton third. The whole thing took 15 minutes. But leave it to the youngest child to stick out from the crowd. Frederick, the baby of the family, actually managed to survive the electric chair, sort of. Not walk clean away from it like Willie Francis would do, but impolitely revive when he was supposed to be laid out dead like folk used to do back in the bad old hanging days. 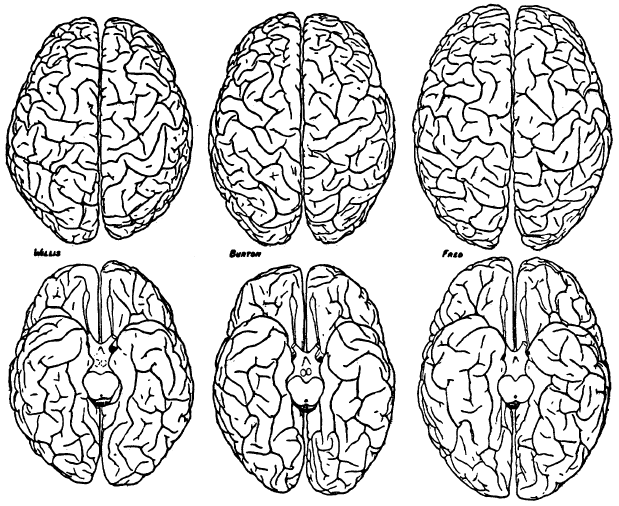 They’re not kidding about that brain bit, either. A fellow by the name of Edward Anthony Spitzka autopsied the van Wormers, “direct[ing] my attention especially to the brains. The opportunity afforded by this triple execution was certainly most rare, and a similar case will not soon occur again,” and found Frederick with a robust 1.6 kg brain, compared to less than 1.4 kg for his siblings. Now that JSTOR has opened its oldest journal content, you can read all about Spitzka’s meddlings in the van Wormer grey matter here. Additional historical artifacts: an original invitation to the proceedings. The Von Wormer rothers were not executed at Sing Sing. They were executed at Clinton Prison in Dannemora. A simple web search woukd have told you this.